Muybridge 738. Tunnel No. 15, looking West. Courtesy Dan Austin. Abstract of a Paper read before the American Society of Engineers, Jan. 5, 1870, by JOHN R. GILLISS, Civil Engineer, Member of the Society. During the past summer the track has been completed across this continent, and so much sooner than was thought possible, that the difficulties overcome are apt to be underrated. Some account of a single item in the great work may therefore be interesting. Between Omaha and Sacramento there are nineteen tunnels. Four of these are on the Union Pacific and fifteen on the Central. Central Pacific Tunnels. — The tunnels of the Central Pacific are nearly all near the summit, where it crosses the western range of the Sierra Nevada. The line here lies on steep hillsides, in some cases being, for long distances, on a face of bare granite, more or less broken by projecting ledges and boulders, but with an average slope often greater than 1 to 1. In such places embankments were almost impracticable ; the hills were too steep to catch the slopes, and most of the rock from cuts was thrown far down hill by heavy seam blasts. 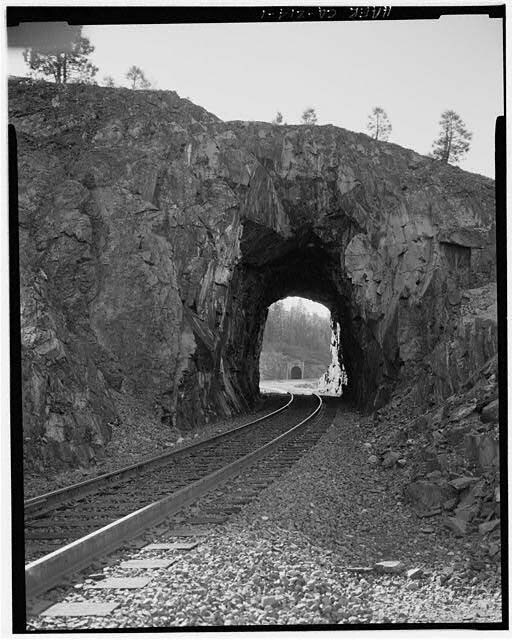 On these accounts the line, for two miles east of Donner Pass, was thrown further into the hill than on original location, thus adding to the depths of cuttings and increasing the number of tunnels, but saving retaining walls, and where tunnels were made, enabling the work to be carried on in winter. Another important object was the saving of snow-covering where tunnels were made, and giving a good foundation for it where they were not. It is within these two miles that seven tunnels are crowded. Tunnels 1 and 2 are both west of Cisco, a small track 92 miles from Sacramento, and within 13 of the summit. They were both finished in 1866. During the fall of that year the track reached Cisco, and as fast as the gangs of Chinamen were released they were hurried to the summit to be distributed among the tunnels in its vicinity. The year before, some gangs had been sent to summit tunnel No. 6, and commenced the cuts at its extremities; winter set in before the headings were started, and the work had to be abandoned. To avoid a repetition of such delay, the approaches to all the tunnels were covered with men, and worked night and day in three shifts of eight hours each. Thus time was saved, and the tunnel organization started at once. As an illustration of the hurry, I may mention walking two miles over the hills after dark, and staking out the east end of No. 12 by the light of a bonfire ; at 9 o'clock the men were at work. In November and the early part of December there were several snow-storms, just enough to stimulate without delaying the work. The rough rocky sides of Donner Peak soon became smooth, slopes of snow and ice covering the trail that led from tunnel 8 to 9; it remained impassable until spring, and communications had to be kept up by the wagon-road, five or six hundred feet below. This, the Dutch Flat and Donner Lake wagon road, was opened soon after it was decided to adopt this route. From the Pass the descent toward the lake was over very rough ground, requiring heavy side cuts and retaining walls with numerous zigzags to gain distance. From this road the scene was strangely beautiful at night. The tall firs, though drooping under their heavy burdens, pointed to the mountains that overhung them, where the fires that lit seven tunnels shone like stars on their snowy sides. The only sound that came down to break the stillness of the winter night was the sharp ring of hammer on steel, or the heavy reports of the blasts. Winter of 1866-7. — By the time winter had set in fairly the headings were all under ground. The work was then independent of weather, except as storms would block up tunnel entrances, or avalanches sweep over the shanties of the laborers. Before tracing the progress of the work underground, it will be well to see the character of weather out-doors. A set of meteorological instruments was furnished by Colonel Williamson, of the United States Engineers, consisting of barometer, wet, dry, maximum and minimum thermometers. These, with wind, clouds, etc., were recorded three times a day, and hourly during tens days in each month. From this record the table of storms given in Appendix C was made. Snow-Storms. — These storms, 44 in number, varied in length from a short snow squall to a two-week gale, and in depth from 1/4 in. to 10 ft.-none less than the former number being recorded, nor had we occasion to note any greater than the latter. This, the heaviest storm of the winter, began February 18th, at 2 P. M., and snowed steadily until 10 P. M. of the 22d, during which time 6 ft. fell. The supply of raw material was then exhausted, but the barometer kept low and the wind heavy from the south-west for five days more, by which time a fresh supply of damp air came up from the Pacific, and then, as the machinery was still running full speed, this was ground up with out delay. It snowed steadily until March 2d, making loft. snow and 13 days' storm. It is true that no snow fell for 5 days, but it drifted so furiously during that time that the snow-tunnel at east end of tunnel No. 6 had to be lengthened 50 ft. These storms were grand. They always began with a fall in the barometer, and a strong wind from the south-west, hurrying up the tattered rain-clouds or storm-scud` in heavy masses. The barometer, which averaged 23 in., would drop sometimes as low as 22 1/2. The thermometer was rarely below 20 deg. at the beginning of a storm, and usually rose to 32 deg. before its close, so that the last snow would be damp and heavy, sometimes ending in rain. The storms ended, and clouds were scattered by cold winds blowing over the eastern range of the Sierra Nevada; these raised the barometer and dropped the temperature at once. The lowest temperature of the winter was from a wind of this sort, 5 1/2 deg. above zero. Our quarters were at the east end of Donner Pass, but still in the narrow part. About the second or third day of a storm the wind would be a gale, sometimes 10 lbs. to a square foot; and would plough up the new-fallen snow to heap it in huge drifts beyond the east end of the pass. About 30 ft. from our windows was a large warehouse; this was often hidden completely by the furious torrent of almost solid snow that swept through the gorge. On the cliff above, the cedar trees are deeply cut, many branches of the thickness of a man's wrist being taken off entirely by the drifting snowflakes. No one can face these storms when they are in earnest. Three of our party came through the pass one evening, walking with the storm-two got in safely. After waiting a while, just as we were starting out to look up the third, he came in exhausted. In a short, straight path, between two walls of rock, he had lost his way and thought his last hour had come. This detail from the contour map of CPRR tunnels (Vose, "Manual for Railroad Engineers" 1883) shows where the original 1844 Emigrant wagon route (green line) was crossed by the tracks of the CPRR (red line) at the east portal of the Summit Tunnel (#6). Just beyond this spot between tunnels #7 and #8 are the so-called "Chinese" Walls (see photograph below) built to support the grade created to fill in the deep ravine between these two tunnels. Snow-tunnels. — Before the snow had acquired depth enough to interfere much with the work, the headings were all started. The cuts at their entrances soon filled up with snow, but drifts were run through them, in some instances large enough for a two-horse team. Through these snow-tunnels, whose lengths varied from 50 to 200 ft., the material excavated was hauled in carts or on sleds to the waste banks. These snow-tunnels kept settling at the crown, so that they had to be enlarged from time to time, otherwise they were perfectly satisfactory. The most remarkable snow-tunnel was made to connect the two ends of tunnel 8. The spur through which this is made terminates in a vertical bluff of granite 100 ft. high. To get around it during the fall, a rope was fastened to the rocks at a point where there was a steep descent of 30 or 40 ft. During the early part of winter, a snow-drift formed on the face of this bluff, descending in a deep slope from its top to the wagon road, 200 ft. below. On this slope a trail was cut and used for a month or two. Later in the winter, when the accumulation of snow made it practicable, a snow-tunnel was excavated through the drift, and around the face of the bluff. Windows were made at short intervals for light, and to throw the material out in excavating, and steps cut where a descent was necessary. One flight of these led down to the blacksmith's shop, buried still deeper in the snow, while the main passage led into one already excavated at the east end of tunnel 8. The snow kept settling down hill and away from the bluff, so that there was an open space of 3 or 4 ft. between it and the rock towards the close, which was far from inspiring much confidence in the route. Between tunnels 7 and 8 there is a deep ravine, in crossing which the road has a 4x5-ft. box culvert, and a retaining wall on the lower side at 75 ft. extreme height. The foundation was begun in fall, but stopped by winter, and the ravine filled with snow. Next spring a snow-tunnel was commenced about 200 ft. down the ravine, and run in to strike the unfinished foundation. Smaller tunnels were run to quarry stone got out in fall, and a cave dug over the foundation large enough to work in. The culvert was built, and by the time it was finished the depth of snow overhead had decreased to 25 or 30 ft.; this was excavated by a stream of water, and the retaining wall commenced. 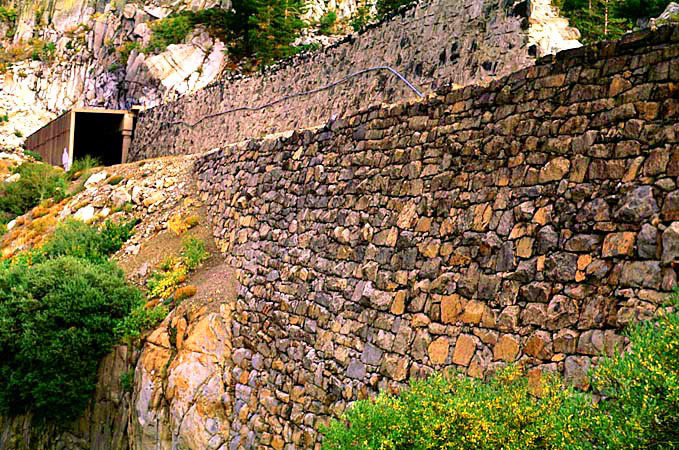 The 75-foot high hand-built retaining wall between Tunnels #7 and #8, in 1999. Photograph by and Courtesy of Peter Epstein. Snow-cuts. — In spring, when the road has begun to be bare, so that sleighs can no longer be used, there are very heavy banks of snow to cut through to make the road passable for wagons. In June I measured one of these cuts through the end of a snow-slide, and found it 25 ft. deep. A week later the road was dusty in the centre, but the snow-banks were not all gone until July, so that we had at that place the strange spectacle of sprinkling-wagons watering a road between two walls of solid snow. Alignment. — As soon as each heading became sufficiently advanced, the centre line was secured, generally by small holes drilled in the roof, with wooden plugs and tacks. These points were placed as far apart as length excavated would permit, and from them the line produced as the work advanced. In most cases the entrances were afterwards so blocked up with snow that it was impossible to recur to the line outside, and the tunnels were completed from the points first put in. In running lines outside during the winter, it was generally necessary to make deep cuts, and sometimes tunnels, through the snow, to get at the original transit points. Most of the tunnels are on curves, No. 13 being on one of 573 ft. radius, with 87 deg. of curvature inside the tunnel. In this, as in No. 11, the usual difficulties of working with instruments by candle-light were much increased by the numerous temporary timbers in the headings. The lines met in the centre of the tunnel, parallel to each other, but 2 in. apart. In the other eases the discrepancies were too slight to notice. Dimensions. — Most of the work was through solid rock, which did not require lining, and the following dimensions were adopted: Bottom, a rectangle, 16 x 11 ft. ; arch, a semi-circle, 16 ft. in diameter ; grade at centre of tie, and 1 ft. 3 in. above sub-grade. Tunnel 11 was partly, and tunnel 13 wholly, lined with timber in the following manner ; 12"x12" sills were placed on each side, and posts 12'x16" mortised into them. The latter support arches, each composed of 3 thicknesses of 5"x12" plank, breaking joints, and bolted with 3/4 -in. iron bolts, thus making a solid arch of 180 square in. sectional area. The distance from centre to centre of arches varies from 112 ft. to 5 ft., according to material. Over the arches, and, where the material required it, on the sides, also, split lagging about 212 in. thick was put in. The width at sub-grade inside of posts is 17 ft. ; at springing line inside of arches, 19 ft. ; giving a batter of 1 ft. on each side. Height of crown above grade, 10 ft. 9 in. ; this leaving room for masonry inside the temporary wooden lining. Tunnels 1 and 2 were lined in a similar manner, except that the batter of side posts were only 6 in. In these tunnels, through soft material, the heading was supported by temporary timbers. Chambers were then excavated at the sides to below sub-grade, for the sills, and the central core left to support the shores which held the material above in place. As the timbering advanced, the core and false work were removed. In tunnel No. 12, a short distance in the centre was found to be decomposed granite, and after the tunnel was excavated a light set of timbers was put in. They consisted of arches, each composed of 7 pieces of 10x19 in. timber, with side posts and sills similar to those already described. In all the tunnels on curves, allowance was made for elevation of outer rail, so that top of cars would remain in centre of opening. Laborers. — With the exception of a few white men at the west end of tunnel No. 6, the laboring force was entirely composed of Chinamen, with white foremen-the laborers working usually in 3 shifts of 8 hours each, and the foremen in 2 shifts of 12 hours each. A single foreman, with a gang of 30 to 40 men, generally constituted the force at work at each end of a tunnel; of these, 12 to 15 worked on the heading, and the rest on bottom, removing material, etc. When a gang was small, or the men needed elsewhere, the bottoms were worked with fewer men, or stopped so as to keep the headings going. The Chinamen were as steady, hard-working a set of men as could be found. They were paid from $30 to $35, in gold, a month, finding themselves; while the white men were paid about the same, but with their board thrown in. The force at work on the road probably averaged from 6,000 to 10,000, nine-tenths of them being Chinamen. The Summit Tunnel (#6) remains virtually the same today as it did when Lewis Clement saw the first CP train roll through it on November 30, 1867, after two years of continuous labor. It is seen here in 1999 shortly after it was taken out of service and the tracks were removed after 130 years of continuous use. View "A" is looking west from the east portal. (The light in the tunnel is from the headlights of the photographer’s truck.) View "B" is taken from the same location looking east out of the snowshed toward tunnels #7 and #8. Photographs by and Courtesy of Peter Epstein. Tunnel No. 6. 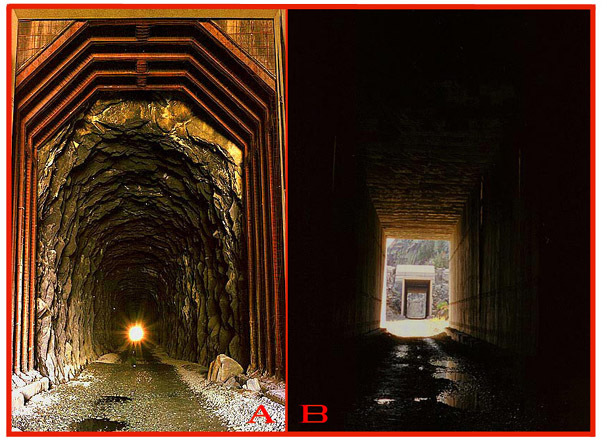 — This, the longest tunnel of the road, is parallel to, and about 400 ft. north of Donner Pass. Its length is 1,659 ft., and greatest depth below the surface 124 ft., measuring from grade. The material is granite, of a medium quality, crossed by seams in every direction. To expedite the work a shaft was sunk about the middle of the tunnel, its dimensions being 8x12x72.9 ft. Work was commenced on the shaft August 27th, and for the first 30 ft. it was sunk at the rate of a foot a day, after which its progress slackened, from delay in hoisting the material with a common hand derrick. Meanwhile a house was being built over the shaft, and the hoisting engine was put up. The latter consisted of an old locomotive, the Sacramento, and, by an interesting coincidence, the first engine run in the State. This was geared to a drum 6 ft. in diameter. The house was 50 ft square, containing in addition to the hoisting apparatus, forges, fuel, tamping, etc., so that when snowed in, these articles would be close at hand. The shaft was divided by planking into two compartments, each 5 ft. square ; over these were two "jiggers" or transfer tables. The buckets were first of wood, then two additional ones were made of boiler plate, 4 ft. 9 in. square by 2 ft. 6 in. high, out side dimensions, and fitted for side dumping. They were loaded at the face of the work below, run on trucks to the bottom of the shaft, hoisted and transferred to other trucks to run out on the waste bank. Total days' work on shaft, 85 ; average progress, 0.85 ft. in 24 hours. Nitro-glycerine had not yet been introduced ; with it the progress would probably have averaged 1.5 ft.
Nytro-Glycerine. — This was introduced on the work early in 1867, to expedite progress of the summit tunnel. It was made on the spot by Mr. James Howden, and used in the four headings of tunnel No. 6 from Feb. 9th, and to some extent in tunnel No. 8, but not enough to give data for comparison. After the headings of these tunnels were through, it was used in the bottoms. 1.82 ft., or over 54 per cent. additional progress. In bottom of summit tunnel, average daily progress with powder, full gangs, was 2.51 ft. ; with nytro-glycerine, 4.38, or over 74 per cent, in favor of nitro-glycerine. The same number of men were used with both explosives. The conclusion we may safely come to from the Central Pacific work, is, that in hard rock tunnels, with the same number of men, over fifty per cent. additional progress can be made by using nitro-glycerine in place of powder, and the expense will be reduced proportionately. 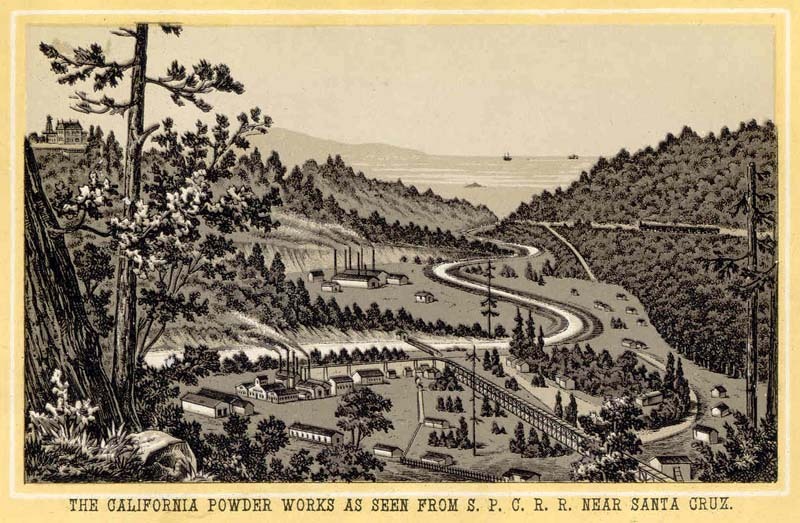 California Powder Works as seen from SPCRR near Santa Cruz. View Book Image Courtesy History's Imprints. 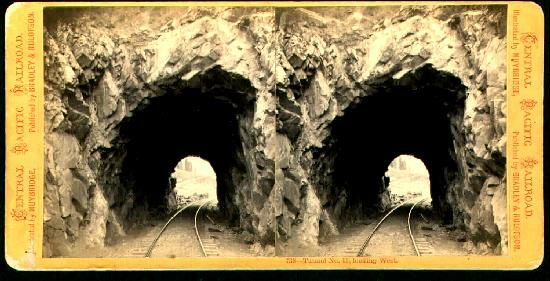 Tunnels of the Union Pacific Railroad. — Tunnel No. 1 is on St. Mary's Creek, about 680 miles west from Omaha, and 12 miles east of second crossing of North Platte River. It was commenced April 30, 1868, and continued from each end until June 8. At that time the two headings were in 86 and 87 ft. respectively, the progress having averaged 2.22 ft. per day. A soft spot was then found in the west end, and there being no means of lining without delay, the open cut was extended to cover the place, and the length of tunnel reduced to 215 ft. This delayed the work, so that a temporary track had to be built around it. Tunnel No. 2 is at the head of Echo Cañon, in Utah, about 972 miles from Omaha. Its length is 772.3 ft., being the longest of the Union Pacific. The approaches were started in July, 1868; they are heavy cuts through clay. Rock was struck about the end of August, and found to be like the prevailing formation in the vicinity, an indurated clay, with occasional streaks of soft sandstone. Most of it drilled very easily, but required as much powder in blasting as ordinary rock. While damp it stood firm, but after sufficient exposure to the air to dry out the moisture, it cracked and crumbled like lime in slacking. These qualities made the work very expensive; rock prices had to be paid, and earth slopes taken out. In starting the headings they had to be supported the same day the excavation was made; but on getting fairly in, the roof would stand weil` a week or two. There was an irregular streak of blue sandstone which ran completely through the tunnel near the springing line. The headings were started at the west end, August 29, and at the east end, September 5; they met January 30, 1869. The tunnel was finished April 3, 1869. When work was commenced on the tunnel, the track was still 300 miles east, and all the available transportation required to haul tools, materials, and pro visions over this gap; it was useless even to think of getting cement in time. There was no suitable stone near the work, and the clay had too much lime to make brick. On these accounts the tunnel had to be lined with timber. Tunnel No. 3. — This tunnel is through a sharp spur of black limestone and dark blue quartzite, 266 ft. of the former and 242 ft. of the latter, total length 508 ft., on a 3 deg. 30 min. curve to the left. The head-rugs were commenced about September 1, 1868, and met April 4, 1869. Until December 27th the work was part of Brigham Young's contract, and sublet to Sharp & Young. It was then carried on as company work, and let to Daniel McGee, a "Gentile," February 9th. Not being finished in time for the rails, a temporary track was built around it, partly on a 22 deg. curve, 260 ft. radius, around which trains of 23 cars were taken. Nitro-glycerine was fairly introduced into the. tunnel by February 23d. About 20 per cent. of the tunnel men struck on account of its use, and were not replaced, as two shifts on the bottoms were found enough to keep them up with the headings, notwithstanding the additional progress they too were making; three shifts had been required with powder. About twice as much work was done per man with nitro-glycerine as with powder. The use of nitro-glycerine in tunnel No. 3 saved the company nearly $40,000. 3 6/10 ft. fuze per cubic yard. Comparison between the two roads. — The total length of tunneling on the Central Pacific is 6,213 ft. ; on the Union, 1,792. The cross sections of tunnels on the two roads are practically identical. The circumstances and materials varied too much to make an accurate comparison of progress in tunnels of the two roads. The greatest average daily progress of heading on the Central Pacific, through granite with nitro-glycerine, was 3.29 ft. On the Union Pacific, through quartzite, about as hard as granite, 4.62 ft. Each road has done over 8 ft. per day at a single face in taking up bottom. The laborers on the Central Pacific were mostly Chinamen, paid $30 to $35 gold per month, working three shifts per day in tunnels, and 12 to 15 men in a heading. On the Union Pacific the laborers were white men, paid $3 to $4 per day currency, generally working two shifts per day, and 8 to 12 men in a heading, on tunnels 1 and 2, and three shifts of 14 to 16 on tunnels 3 and 4. The Central Pacific Railroad was built under the direction of S. S. Montague, Chief Engineer. The location and construction across the Sierra Nevada were in charge of L. M. Clement, Resident Engineer. The account of tunnels on that work is principally compiled from a report on the subject written for the latter by the author, while engaged on tunnels 6 to 13 of that work. The Union Pacific Railroad was built, and its location revised, under the direction of S. B. Reed, Engineer and Superintendent of Construction. The accounts of tunnels 1 and 2 are from personal observation, and of tunnels 3 and 4 from data furnished by Edward P. North, Resident Engineer of work in Weber Cañon. Note: The incorrect spelling of L. M. Clement in the original has been corrected. More complete version 1 of this article. More complete version 2 of this article.